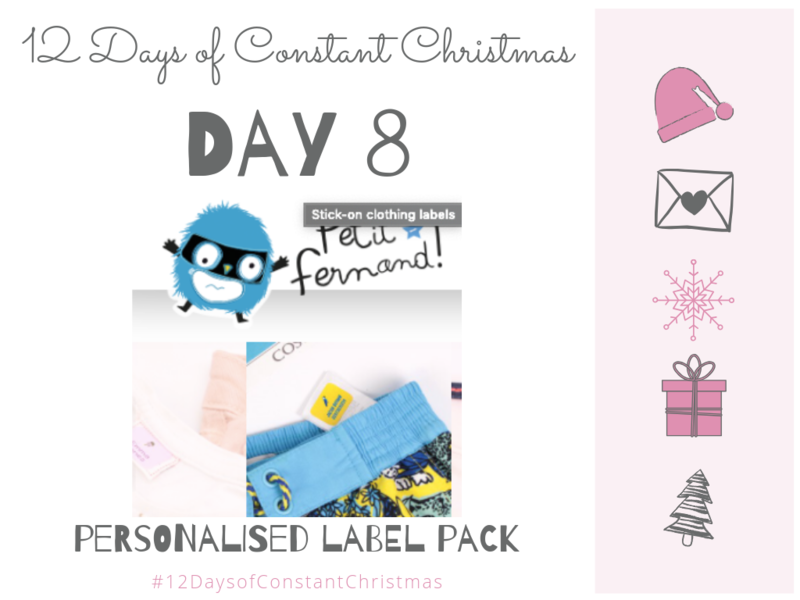 Today is #12DaysofConstantChristmas Day 8 of my advent competitions. I am very excited to be back running these fabulous advent competitions again. Over the first 12 days of December there will be a collection of 24 hour competitions followed by Day 12, the finale competition – that is a longer competition and for a bigger prize, over £500’s worth of prizes this year! Today’s competition is for a pack of personalised labels from Petit Fernand. With all of this pack’s different designs, you can easily label and identify all of your child’s clothes and belongings! This pack includes everything you need to make sure that what leaves comes back home. Our pack contains: 20 iron-on clothing labels that you can apply with a household iron, 20 stick-on clothing stickers to apply on care labels, 100 item stickers to mark down all objects with a smooth-surface, such as school supplies, books, notebooks, pens, pencils, scissors, glue sticks… and even shoes! But the best part is, you can personalise your labels’ backgrounds, fonts, font colours and illustrations! In this competition you will win a pack of personalised labels from Petit Fernand, RRP £30. All you have to do to be in with a chance of winning this #12DaysofConstantChristmas Day 8 prize, is fill in the competition entry form below, it really is that easy. If you have any problems then please do get in touch. I woul label school uniforms, bags and lunch boxes. I would use them for my nephew and niece’s school things -uniform,bags etc. All of my sons school stuff, uniform, bag, lunch bag etc. I would label everything that can be labelled! Birthday cards and all the crafty things we do to while away the cold winter days! Would be great for labelling the school clothes! I would give these to my brother. My niece starts nursery school next year and these would be really useful. Two boys who lose a lot of stuff…so everything that goes to primary school, probably also saving some back for son number one’s entrance into high school next September – lawks! Everything they take to school because things are always going missing! Everything my children tend to lose all their bits and pieces. My son is due to go camping again so this would be helpful to label everything up! All my kids uniform and other belongings. All my daughters school uniform! !